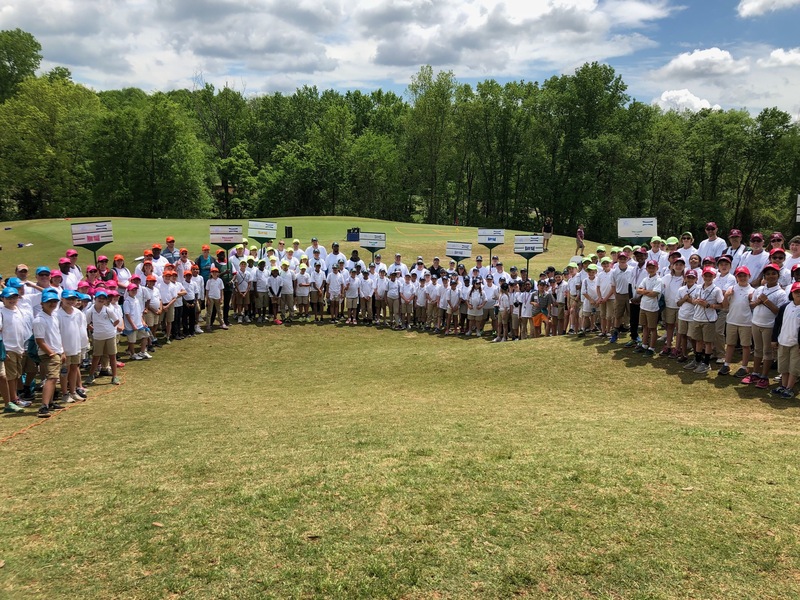 If you ask anyone on the staff at The First Tee of Greater Charlotte what their favorite day of the year is – hands down, they will answer: “The Champions Challenge.” This culminating celebration of The First Tee National School Program features two proud 4th grade representatives from over 50 elementary schools and five school districts within the Greater Charlotte area competing for a chance to be crowned as the ultimate competition winner. The morning starts with the arrival of volunteers – over 100 men and women donate their time to make this event happen. Scorekeepers, hole captains, standard bearers and team captains all work together to execute a flawless morning. Next to arrive on site are the students. Two 4th graders from each school are selected by their PE teacher to compete in a 9-Hole SNAG skills challenge. 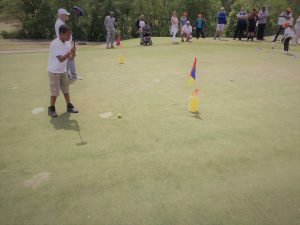 Students are selected based on their knowledge and exhibition of The First Tee Nine Core Values and Nine Healthy Habits. As they wait in line to check-in, you can feel both the nervousness and excitement of what the day will bring. 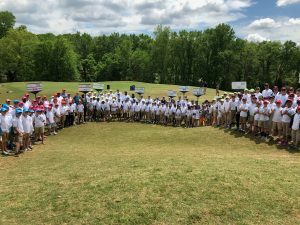 Each student is handed a new golf shirt and hat and then escorted to find the rest of their 10-person team which is made up of students from other schools and school districts. Team captains organize their players in the staging area – doing warm-ups, reviewing core values and ultimately lining their team up for the opening processional. Spectators take their places around the putting green while the hum of bagpipes signals the start of the day. Students march toward the green with their teammates forming a large circle of brightly colored ballcaps and smiling faces. Following opening remarks, an air horn sounds and the competition is officially underway. 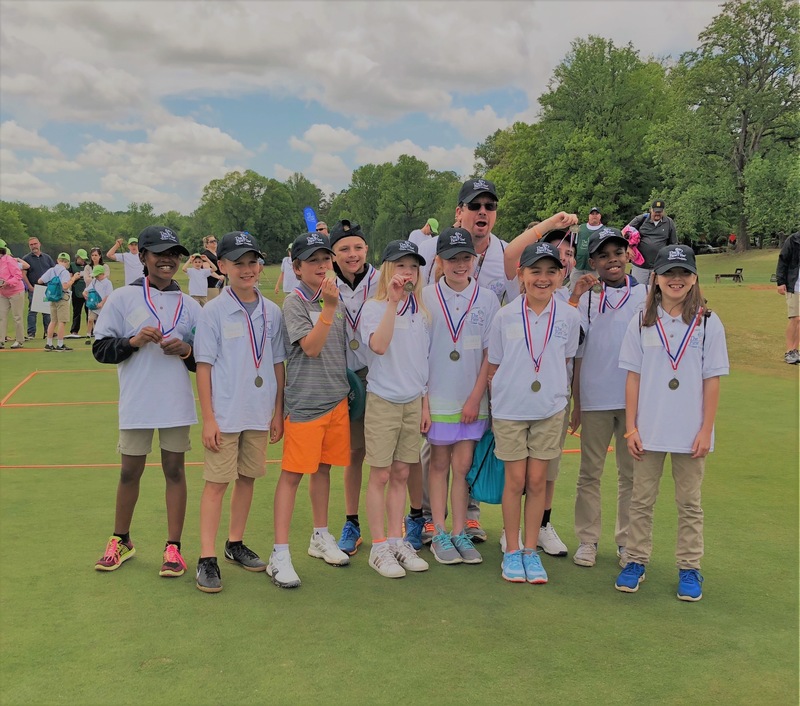 Over the next two and a half hours, students compete in challenges that test their golf skill, knowledge of the core values and physical fitness all while earning points for their team. Atrium Healthcare provides a 30-minute program for all competitors on their 5210 League (5 servings of fruits or vegetables a day; 2 hours or less of screen time, 1 hour of physical activity, and 0 sugary beverages). The students then try their luck against Golfzilla – a 10 foot tall inflatable dinosaur who collects golf balls in his hands, feet and mouth. The morning ends with the final blow of an air horn and teams once again gather around the putting green to hear the results of the competition. One team of ten students is ultimately awarded the winning medals. As they accept their awards, it’s unclear who has the bigger smiles – the students or the proud volunteers who helped them to victory. If you stop and take a look around The First Tee campus, you will see something really special – community. A community of volunteers, a community of corporate partners, a community of parents, students, and physical educators all being brought together by a common thread – the inherent core values and healthy habits that the game of golf can bring. 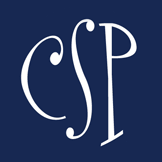 Meet the Senior Company at Jami Masters School of Dance!